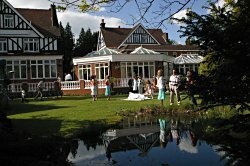 Our first involvement in the Ardmore House Hotel, St Albans, was some years ago when we were asked to design and build a lounge bar extension in the style of a Conservatory to the front of the building that would be acceptable to the conservation officer. 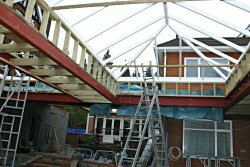 After this successful project we created a breakfast room off the dining room as a conservatory (visible to the right of the Orangery) . The final phase was to create a wedding hall / conference hall that connected the two and overcame the 1.5 meter difference in floor levels. 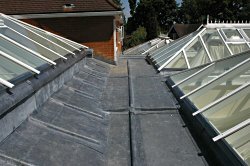 Although a commercial project this Heritage Orangery was built using all the same techniques we have developed over the years on our domestic projects, all of which have had to comply with building regulations. 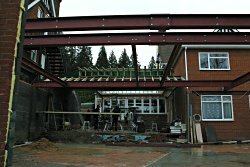 At the heart of every Heritage Orangery is steel! 13 tons of it on this occasion. This is all carefully proved by our structural engineers and rechecked by building control. 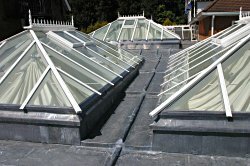 The crowning glory of every Heritage Orangery is the glass lanterns and specialist leadwork. 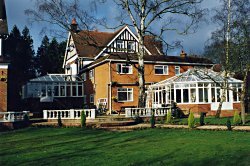 Our lanterns are always made using the finest hardwoods from sustainable sources with any of the latest glazing options available. We only use traditional leadwork for our decking as nothing else looks the same or has the same permanent durability.